The FCO's Consular Division aims to look after the safety of British travellers overseas. This site offers access to the full range of country-specific Travel Advice notices, and a selection of information designed to ensure that British travellers are well prepared before departure. 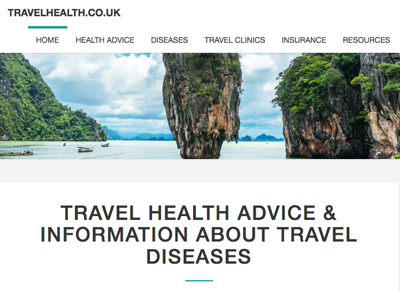 Fitfortravel is a free, interactive, public access website providing up to date health information for the UK public on avoiding illness and staying healthy when travelling abroad. Advice for people travelling abroad, including malaria, travel vaccinations, EHIC, travel insurance, DVT and jet lag. As more and more people travel to different parts of the world, they come in contact with diseases rarely seen in the UK or other developed countries. The Travel Doctor is a good site which helps travellers look after their health before, during and after such a trip. Travel Health Advice & Information About Travel Diseases. The information and advice on TravelHealth is nurse-led. The site content has been researched and is reviewed by UK Travel Health professionals. TravelHealthPro is the website comprising the travel health resources of the National Travel Health Network and Centre (NaTHNaC). The NaTHNaC aims to help protect the health of British travellers. Travelling in Europe is the European Union's official website for people travelling in the 27 countries of the EU. Whether you are on holiday or on business, you will find practical advice and helpful tips on a wealth of subjects, from what documents you need, to getting healthcare and using your mobile phone.